Located on the corner of 1st Avenue and James Street, the Pioneer Building has become one of the most iconic buildings in the city of Seattle. 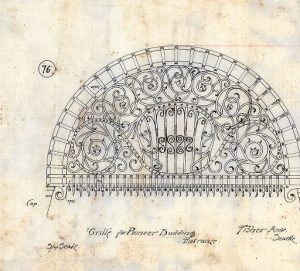 The captivating history of the Pioneer Building began before it was even constructed, when Henry Yesler built Seattle’s first sawmill on the spot in 1853. 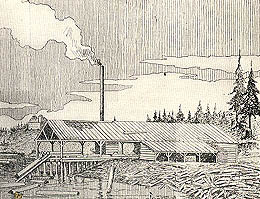 Producing low quality lumber (by Yesler’s own account) the mill operated 24 hours a day and sent lumber as far as Alaska and Hawaii (historylink.org). Soon other, more technically advanced sawmills began to crop up in the area, expanding the Seattle lumber industry rapidly. 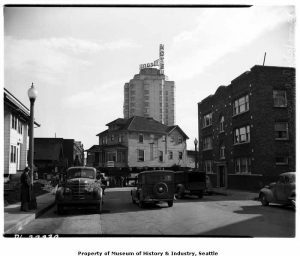 The role that Yesler’s sawmill played in establishing the city of Seattle cannot be denied; it launched the lumber industry in Seattle which helped to create the city that we know today. 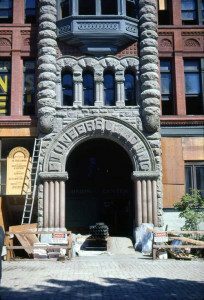 By the beginning of 1889, Yesler had hired architect Elmer H. Fisher to construct the Pioneer Building, and excavations began soon after. But, on June 6, 1889, the Great Seattle Fire swept through Seattle’s commercial district, razing it the ground. 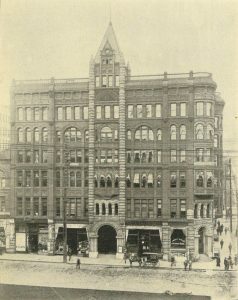 Remarkably, the excavation for the Pioneer Building along with Elmer Fisher’s drawings survived the fire, and construction was completed on the building in 1892 (historylink.org). 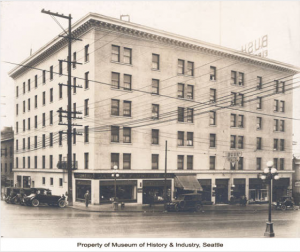 Some of the building’s first tenants included The Puget Sound National Bank of Seattle, the Union Trunk Line, and the King County Medical Society. The Pioneer Building has been used for a number of purposes and housed a variety of different companies throughout its 125 years. 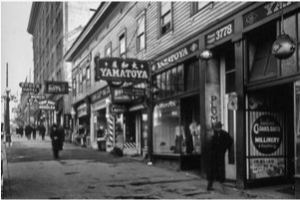 Between 1897 and 1908 , amid the Klondike Gold Rush, it became a hub for mining companies, and it was “Seattle’s finest speakeasy” in the 1920s during Prohibition (Pacific Coast Architecture Database). The building began to fall into disrepair in the 1930s, continuing into the 1940s and 1950s. 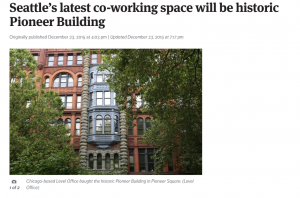 During the late 1950s, however, support mounted for renovation and rehabilitation of Pioneer Square, with the Pioneer Building being one of the main focuses. In 1970 it was added to the National Historic Places list, and saw significant renovation by 1980. The Pioneer Building has changed hands three times since 2001. After being acquired by 600 Pioneer LLC in 2001, it was sold to Sun Capital Corporation in 2014 for $12.3 million. Finally, a Chicago-based real estate company, called Level Office, bought the building in 2015 for $20.5 million, and it now houses offices for small businesses. During its 125 years of existence, the Pioneer Building has carved a place in Seattle history and created a legacy that will endure for years to come. 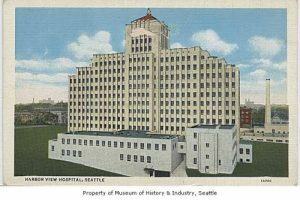 For my Seattle Building History report, I chose Harborview Medical Center. 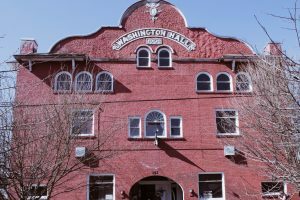 The hospital is owned by King County, and was built as a two-story six-bed King County Welfare Hospital in 1877. The hospital first moved to Georgetown by 1906, and had 225 patient beds. The hospital was originally named, “King County Hospital” and was renamed after its second move in 1931. This was when the center wing of the current hospital was completed. 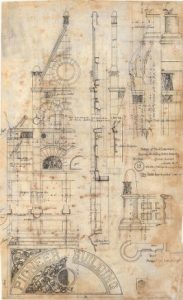 I had much difficulty locating a map of the building prior to both moves. 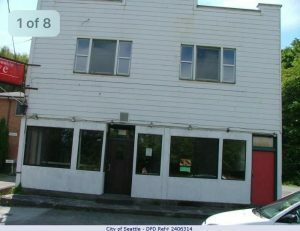 King County’s website, on December 19, 2016, states that the county is working on preserving Harborview Hall, and to establish the building as “a landmark building in the heart of Seattle’s hospital district.” Unfortunately, I was not able to find any updated information regarding the preservation of Harborview Hall. First built in the early 1900’s Taylor Mill’s Grocery appeared along Lake Washington’s Southern shore. Built and owned by Stanford Taylor, who ran a lumber mill around present day Rainier Avenue, the small grocery store supplied food and other goods for the 100 mill workers and their families which lived in the surrounding area. Taylor Mill’s Grocery, located at “the corner of 68th and Rainier,” served the community not just as a grocery store but also “as [a] post office, watering hole, and unofficial community center.” It was a surprisingly successful grocery store in the developing Rainier Beach region, and managed to stay open into the 1930’s. 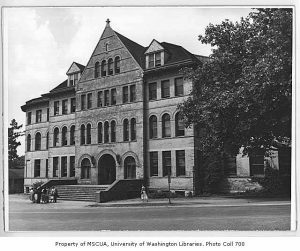 After officially closing in 1937, the building remained mostly unused. 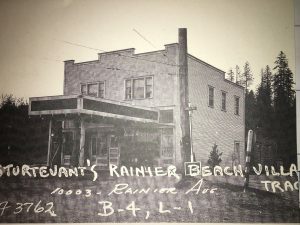 In the 1950’s the building was converted into the Lakeside Tavern, becoming an official ‘watering hole’ for the Rainier Beach community. 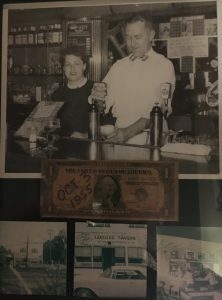 During the years between the 1930’s and 50’s, the building switched ownership and by the time the tavern was opened by the Barlow family the building was owned by the Punsala family. 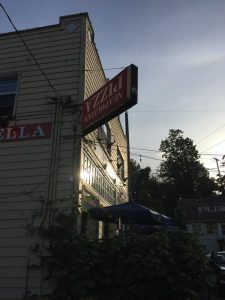 The tavern remained in operation for over 40 years, and was a well-known bar in the Rainier beach region, if the number of patrons returning to the now Pizzeria recounting stories of drunken absurdity is anything to go by. The tavern was also well known due to the fact that the sign hanging outside on the side of the building was upside down. Vince Mottola, current owner of Pizzeria P ulcinella, recounts the disagreement between the owner of the Lakeside Tavern, Mr. Barlow, and the man installing the sign, stating that the two came to a disagreement over payment and in protest over receiving only half of the agreed payment the man installing the sign flipped one side of it upside down and refused to correct it unless he was paid the other half. 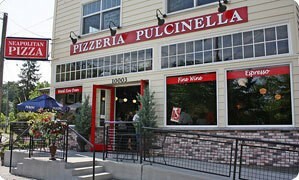 Exhausted by the repeated exchanges between the sign company and himself, the owner left the sign upside down and from then on it was known throughout the community as the tavern with the upside-down sign, a tradition that Pizzeria Pulcinella’s owners honor and they continue the tradition with their own sign. the owners to allow him and his other business partners, Fred Martichus ki and David Dorough, to open a restaurant instead. Not only have they preserved the building itself, but also, they have managed to install the previous Lakeside Tavern’s sign inside of their restaurant preserving its history as well. Pizzeria Pulcinella has now been in operation for over 8 years and “has been ‘certified Neapolitan’ by the Verace Pizza Napolitana Association since 2009.” And hopefully it will be open for many more! Thanks to the University of Washington’s Special Collections. Parrington Hall was build 6 years after Denny hall making it apart of the original campus (see map below). The building was finished in 1902 and was called the Science Hall. 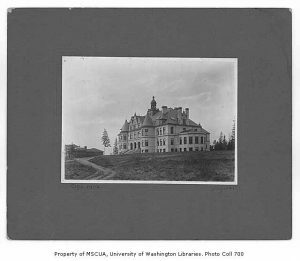 A contract, now within University of Washington’s Special Collections, shows that the owner of the land at the time, Auton Bereus Witnesseth, agreed to let the University of Washington build the Science hall on his land. The document was very hard for me to understand but I interpreted that Witnesseth was going to pay for the building and if he could not the land would go to the University. 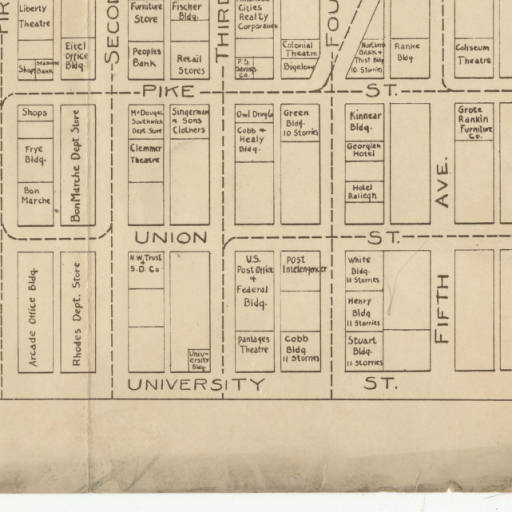 UW1 <– map from 1909, thanks to the University of Washington’s microfilm collections. Both the department of Botany and department of Electrical Engineering started in this building and eventually moved to other buildings The Department of Electrical Engineering moved there operations in 1910 and the Department of Botany moved later in 1930’s. Now the building is a center for Daniel J. Evans School of public police and governance. In 1931 the building was remodeled by John Graham Architect. They installed a new sewer, re-shingled the roof, waterproofed the building and many more. I have read other resources that state it was remolded another time but could not find any documentation of the remodel. When you come out of the station in International District today and head east, you will probably spot the “Modern Fire Proof” Bush Hotel. Today, it is Section 8 housing for lower income residents, but it did not start out this way. In fact, it didn’t even start out as the “Bush” Hotel. 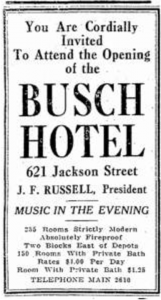 When it was built in 1915, William Chappell named it the “Busch” Hotel, as can be seen in the newspaper clipping advertising the new hotel below. Beginning the very next year in 1916, women’s clubs began hosting events in the Busch Hotel, including a post card party. After the name was changed in 1921, it was renovated with “local products,” likely local lumber and finishes. In 1926, according to an article in the Seattle Times from 1976, one Kemekichi Shibayama leased the building for thirty-five thousand dollars and reconditioned it for sixty-five thousand. However, as the Depression and Second World War came up, Mr. Shibayama had to give up the hotel for a time. 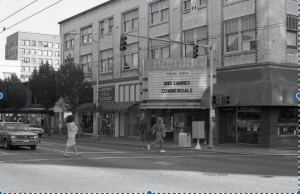 In 1978, articles in the Seattle Times began discussing the renovations of the International District overall. The Bush Hotel (wrongfully referred to as a “pre-1910 building”) was being looked at as a new community center as the upper levels had not been used for years. City officials were concerned about the integrity of the building. 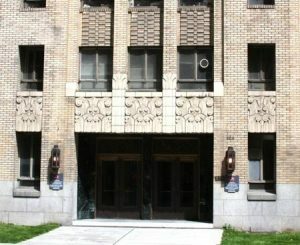 As of September, 1978, the Times announced plans to convert the hotel into a mixed purposed building including residential rooms and community spaces as it had been acquired by the city and they had gained federal funding to create more affordable housing developments in the District. 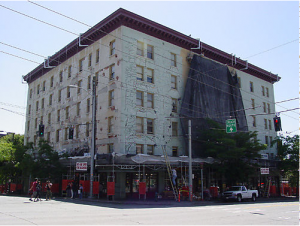 Today, the Hotel still stands as one of the most prominent buildings in the International District, having survived through multiple renovations since its original opening in 1915, and now serves as affordable housing. 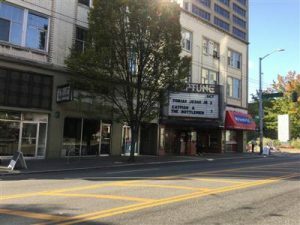 1300 3rd Avenue, Seattle, WA is the site of a Pantages Theater that is no longer standing today. Alexander Pantages, the “king of vaudeville” commissioned Benjamin Marcus Priteca (23 years old at the time) to design and build the theater in 1915. Pantages liked Priteca’s work so much he hired him to create many more theaters and stage houses all across the Pacific Northwest. Pantages was a beautiful theater designed with classical and Renaissance architecture. 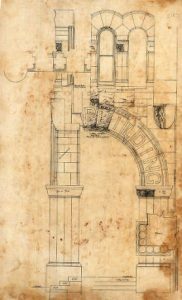 The building was lavishly ornamented, but also not as expensive as it was made to look. 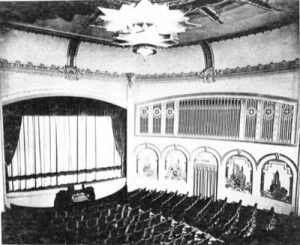 This was a unique theatre because it hosted traditional plays, vaudeville acts and also played moving pictures (films) with a live orchestra. 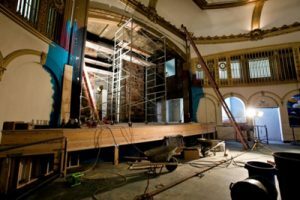 Historian Chris Skullerud lists eight name changes for this theater, beginning with New Pantages, Follies (1931), 3rd Avenue (1931), Rex (1935), Mayfair (1935), New Rex (1936), and Palomar (1936-1965). It was unclear if these name changes were due to a change in management, or if these were colloquial terms for the theatre because there were so many Alexander Pantages theaters in the area. Alexander Pantages died in 1936 and since his death the theater had (somewhat) consistently been called Palomar. In the pictures below the theater is located on Third and University. 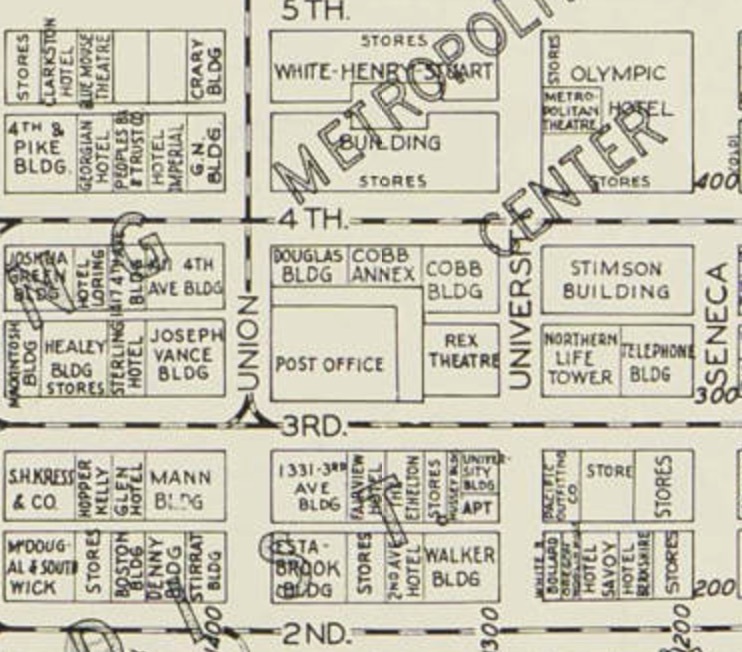 The map from the 1920s calls the theater Pantages, while the 1930s map calls it Rex Theatre. As of 1936 the Pantages was officially the Palomar theater. Palomar hosted a number of vaudeville acts and was one of last vaudeville playhouses up until the 1950s. Pantages also hosted African-American musicians such as Bobby Tucker and Sammy Davis Jr., Louis Armstrong, and Duke Ellington. The last public show was “Annie Get Your Gun” performed in April of 1965. The Palomar was gutted and demolished to create a parking garage that year. The parking garage is still standing at 1300 3rd Avenue, Seattle, WA today. 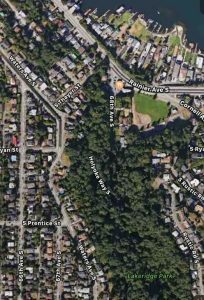 In the late 19th century realtors seeking out waterfront property in Seattle named an east side neighborhood Madrona, after the identically-named tree. 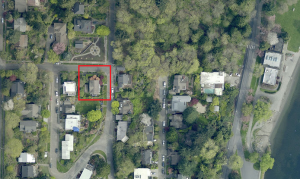 In 1919 a single floor house was built located at a corner of the Madrona woods, at what is now 38th Ave. and East Columbia St. 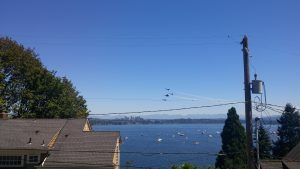 The house was well located with a fantastic view of Lake Washington as well as the Cascades from Gordon Ridge all the way to Mount Rainier! 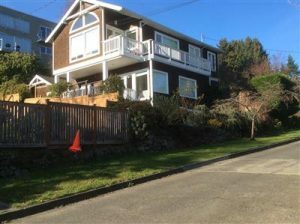 Being built only 30 years after the first house was erected in Madrona, it has had a long history in the neighborhood and is now a much different building than when it was first created. 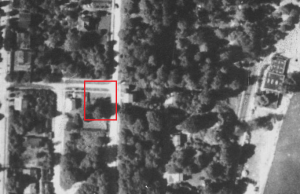 Aerial photographs from 1936 show a tiny structure obscured in the shadow of neighboring trees. 80 years later similar aerial photographs show a sizable building along with a lot of other development around. 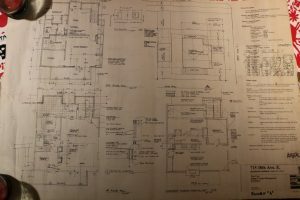 While it is not clear how many changes happened between 1919 and 1997, remodeling plans from November of 1997 show the addition of an entire second floor with 2 bedrooms, 2 bathrooms and 2 decks. 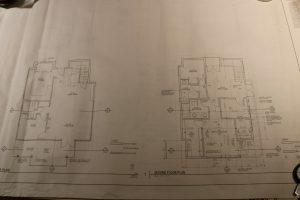 Remodeling plans from 2002 show the upstairs master bedroom being converted into two separate bedrooms, with the addition of a closet and the removal of one of the two upstairs decks. The small office on the first floor seems to be the only room to be left in its original form from the pre-1997 design of the home. If you’ve visited Seattle’s University District, you have probably noticed Hotel Deca, a towering structure located at the corner of Brooklyn Avenue and 45th Street NE. Its Art Deco style, boutique feel and proximity to the University draw guests today, just as they did when the hotel first opened in 1931. 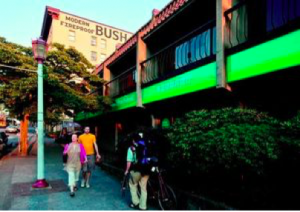 The idea for a hotel in the University District came from members of the community and local businesses under the University Hotel Operating Corporation, which raised $297,700 to buy the land and then further financed the construction through the sale of stocks and bonds. 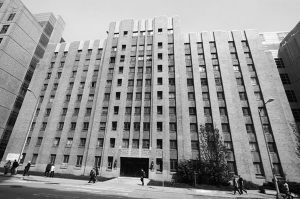 After amassing the required capital, the Hotel Corporation chose Robert C. Reamer to design what they envisioned to be a cultural and social landmark for the neighborhood. In keeping with their commitment to community engagement, the Hotel Corporation hosted a contest to name the new hotel, with the ultimate winning entry honoring Edmond S. Meany, a beloved professor, former state representative and local icon of the time. 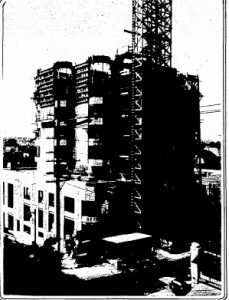 Construction of The Hotel Edmond Meany began in 1930 and was extensively covered in The Seattle Daily Times, which featured several photos at various stages of the building’s construction, one of which is shown here. The structure is in the modernist Art Deco style and is primarily made of steel reinforced concrete, which was poured in place. Sixteen stories tall, the hotel featured nearly 150 rooms located around a central elevator shaft and stairwell – allowing the hotel to proudly boast that “every room is a corner room.” When the building opened on November 12, 1931, it was celebrated with a grand banquet and ball. The honored guest of the evening was Edmond S. Meany himself, who was the first person to sign the hotel registry. 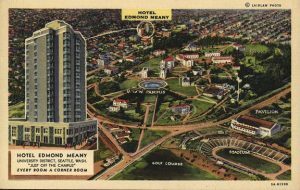 Since its opening, the Edmond Meany has changed hands three times, but has always remained a hotel. While today the external structure looks much as it did in 1931, the interior has been redesigned several times. Notably, a renovation in the 1990s by Seattle architecture firm NBBJ sought to restore the 1930s style of the hotel by revealing older floors and columns to recapture the initial design of the building, which had been plastered over through the decades. 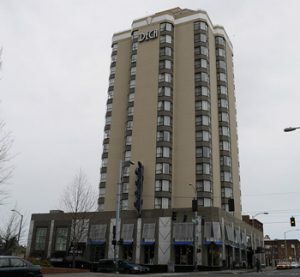 The name has also shifted from the Edmond Meany Hotel to the Meany Tower Hotel to the University Tower Hotel – before attaining its current name, Hotel Deca, in 2008, when the building was acquired by Noble House Hotels and Resorts. 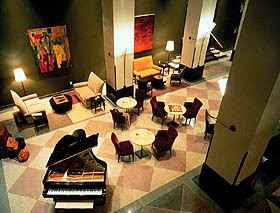 The hotel has served and continues to serve as an icon of the University District and a popular location for functions and meetings. Today much of the original majesty of this storied hotel still survives, so if you have the chance, go inside and have a look around the lobby!